Today marks the public debut of my roommate Liz’s cast iron skillet. Now, don’t be deceived; the skillet is not a recent addition to our home. Instead, it’s been hiding under our coffee table, collecting dust and cat hair since Christmas. That’s a long time to keep something so valuable in a dormant state and out of use. But alas, we have another skillet (see: Swiss Chard Mélange & Turkey Quinoa Burgers) that is much more manageable in size and is, ahem, already seasoned. This skillet has almost gotten its break a couple times. Once, at a party, I saw someone pull it out from under the table to admire its cast iron-y charm. Unfortunately, this wasn’t a dinner party, so he put it back and chugged his beer. I think we may have used it at least once, when washing the other one seemed more daunting than our present state of hunger could handle. I took her lead, and the result was marvelous. Potatoes in eggs?! I am a changed woman. I’ll level with you – the veggie selection was more spontaneous than planned, as we used whatever was in the fridge. 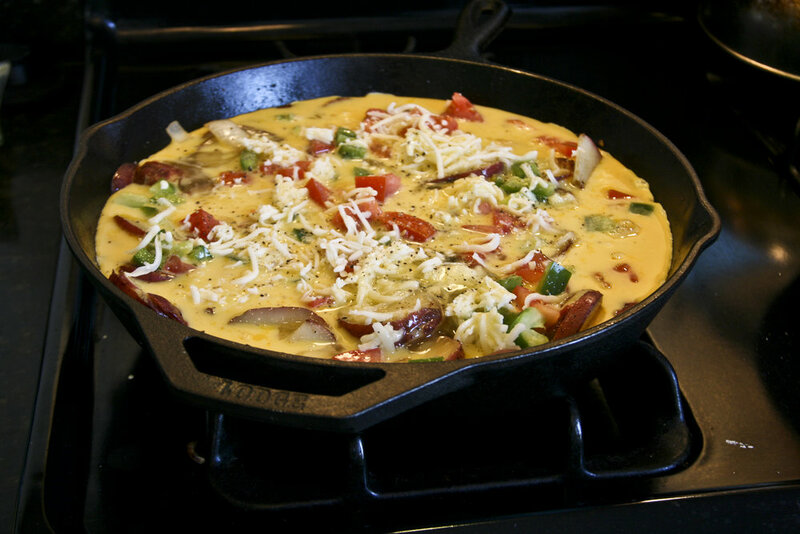 You can add just about any greens, reds, or what-have-yous to the skillet, just don’t forget the potatoes. I understand that Farmer’s Breakfast is usually more of a scramble, but baking and serving it in slices made it easy for a crowd. Alas. Our dear cast iron skillet has reclaimed its rightful place under the coffee table, where it will likely remain until the next time we feed a substantial group, or, at least until a curious drunk discovers it at another party. 1. Preheat oven to 375oF. 2. Whisk eggs and milk together. Set aside. 3. In a large oven safe skillet, heat butter and some olive oil. 4. Add potatoes, onions, paprika, garlic salt, salt, and pepper and sauté until browned and a little crispy. 5. Sprinkle remaining vegetables and half the cheese on top. 6. Pour eggs over everything, distributing evenly. 7. Sprinkle the rest of the cheese and grind a bit of black pepper over the top. 8. Bake for 20 minutes. Let cool for 5 minutes and serve warm.